Adam Scott of Australia plays during the World Golf Championships-Cadillac Championship at the Trump National Doral Blue Monster course in 2016. Donald Trump is not only the U.S. president; he's also a golf industry giant. And like other golf course operators, he has a stake in the legal wrangling over a new environmental rule that could dent industry profits. Here's where Trump is different from his peers: He gets to name the head of the Environmental Protection Agency, and this week, the president may appoint a nominee to the U.S. Supreme Court, which soon will hear a case involving the environmental rule. The situation highlights the conflicts between Trump's two roles — one as president, the other as business owner. Although he has stepped back from day-to-day management of his companies, he has not sold off his stake in the Trump Organization. His sprawling business empire includes a dozen golf courses in the United States alone. The jewel may be Trump National Doral, just outside Miami. It's a resort with a hotel and a spa. At a campaign event in October, Trump said he was especially proud of Doral's four golf courses. 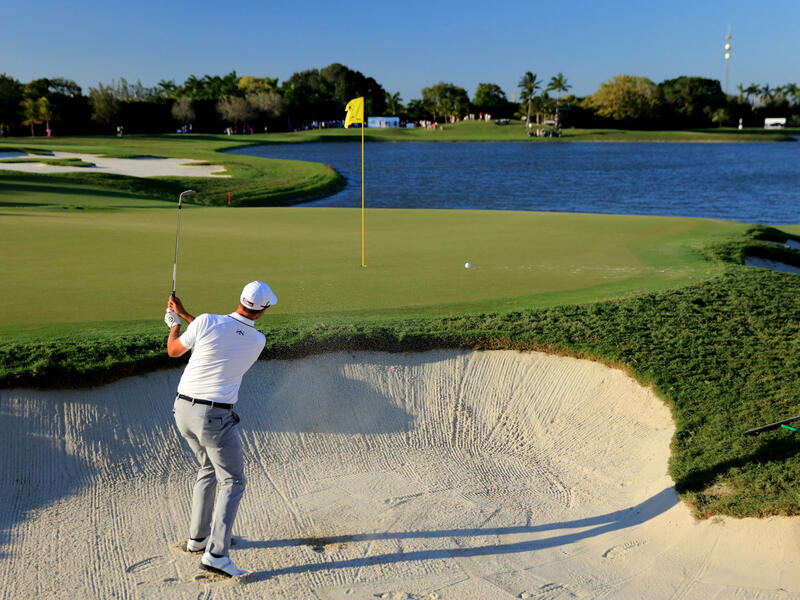 "As you know, the Blue Monster is one of the great courses of the world," he said. But like any golf course, it is subject to various regulations. And there's a pending rule that the golf industry hates. In 2015, under the Obama administration, the EPA and U.S. Army Corps of Engineers finalized the Waters of the United States rule to apply clean water regulations to thousands of new streams, lakes and wetlands. Under the rule, the Blue Monster — and all golf courses in the U.S. — would be subject to closer federal regulation. The rule is opposed by a long list of industries, including manufacturers, farmers and golf course owners like Trump. They have been filing lawsuits that have put the rule on hold. Bob Helland, with the Golf Course Superintendents Association of America, says the average golf course has over 11 acres of streams, ponds and wetlands that could be affected. Under the rule, courses may now need federal permission before applying fertilizer or pesticides. "Many of our routine activities would be deemed as a discharge into waters of the United States and could not move forward without getting a required permit," Helland said. Trump's course superintendents are members of Helland's association. Now, in his role as U.S. president, Trump has pledged to roll back the new environmental rule. His nominee to head the EPA, Scott Pruitt, is also a staunch opponent of the Waters of the U.S. rule. As Oklahoma attorney general, Pruitt filed a lawsuit to overturn it. For the Trump administration, overturning the rule isn't something that can be done through executive order. The EPA would have to restart the lengthy rulemaking process, according to Jon Devine, an attorney with the Natural Resources Defense Council. "Repealing a rule requires a full public process and has to be justified by the law and the evidence available. And in the case of the clean water rule, that's going to be rough sledding for the Trump administration," he said. This month, the Supreme Court decided to weigh in, agreeing to hear a case that will determine which federal court has jurisdiction over the rule. It's possible Trump's nominee to the court will hear the case. Larry Liebesman, a former EPA and Justice Department lawyer, says any further action will likely be put on hold until there's a Supreme Court ruling on jurisdiction. "It gives the administration a little down time to figure out how to handle the situation. It also suggests that maybe Congress may step in and legislate on this issue as well," says Liebesman, now a consultant with Dawson and Associates. With the threat of a presidential veto gone now, opponents of the rule are hoping Congress takes action to kill the rule. This month, Republican Sens. Joni Ernst from Iowa and Deb Fischer from Nebraska introduced a resolution to begin that process.